Metro area seniors were recently honored at luncheon hosted by the Omaha Rotary Club as the 2018 Outstanding High School Senior from their schools. Mount Michael Benedictine’s Honoree was Garrett Gloeb. Garrett has received major scholarship offers from Creighton University, Saint Louis University, and the University of Nebraska-Lincoln (Regents Scholar). 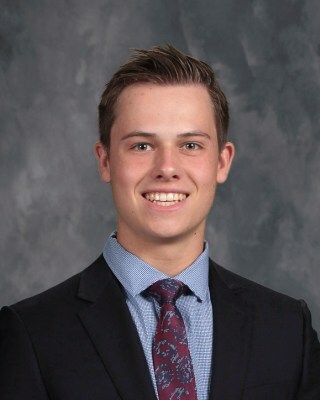 Garrett was recognized as a National Merit Finalist, and prior to this was recognized in 2017 with the National Spanish Examinations junior travel award, distinguishing him as one of the top 24 Spanish language students in the United States, and first ever in Nebraska. Garrett received first honors all quarters at Mount Michael and was an inductee into the National Honor Society in 2016. He is a three-year varsity football letter winner, a two-year varsity baseball letter winner, and was a starting member of the 2016 Junior Legion district championship team. In 2018. Garrett tutors’ younger students in math and athletics and has volunteered his free time conversing and strolling with the elderly at a metro-area retirement home. Over his life he has challenged himself to learn and to compete academically and to compete academically and athletically at a high level. Garrett’s strong religious beliefs have taught him that God’s essence is present in all, and that individuals are called to support one another in whatever fashion affordable by circumstance or experience. Garrett intends to study biochemistry on a pre-medicine track. He plans to attend Notre Dame, Dartmouth. or Creighton. Garrett’s parents are Matthew and Kristi Gloeb of Bennington, Nebraska. Garrett is the son of Matt ’82 and Kristin Gloeb and attended Saint Vincent de Paul School before coming to Mount Michael.